This weekend we (my family and I) spent most of our time listening to our religious leaders speak about what God wants us to do today. I was uplifted, and I feel eager to do good in my life. One of the talks given at this General Conference that really struck me was by Gary E. Stevenson. He spoke about how to wear “gospel glasses” to help give us perspective and protection. He went on to give examples of how to wear these glasses in regards to social media and pride. Since I heard the talk I have pondered about how I can apply his words to my life. The result of my listening and thinking is this post. I love Instagram! The beautiful images and short messages are fun for me to look at. It is a platform that has connected me with people I might not have known otherwise and has brought light and inspiration into my life. But at one point, Instagram was was depressing me! Elder Stevenson nailed it when he said that social media is 1) time consuming 2) draws us away from real face-to-face interaction with others and 3) creates discouragement, envy and failure when we idealize reality and make debilitating comparisons. I love interior design so I follow a lot of talented designers that have created gorgeous spaces and have the resources to do so. Right now my full-time job is wife and mother, and although there are rewards in my job, they are usually not in the form of large paychecks that pay for home renovations and or getting new homes. Despite understanding this, I still ached and yearned to be able to show myself that I could transform a space. I also convinced myself that I could not be truly happy until I was like the people that I followed on Instagram. Now, this may seem crazy to some of you, but the struggle was real and pervasive. I realized that I needed a paradigm shift or I would not be able to use Instagram anymore. Here are the things that I decided even before I heard Gary E. Stevenson’s talk. I hope they will help you to have a healthy relationship with Instagram and social media in general. I have two choices when I see a post. I can either get mad that I don’t look a certain way or have the same things as someone else and feel unhappy and short-changed OR I can see the photo as inspiration, uplift and an opportunity to learn. Remind yourself that everyone is on a different journey, and you can be okay with where you are. The people on Instagram or other social media platforms have worked really hard to create a beautiful feed. There is planning, photography skills and money involved. I know because I have researched how it is done. If someone is working hard at something and they have the great results to show, I applaud them. I have gone from feeling envy to feeling excited for others. We all have different talents and sometimes they are visual ones that can be shared on these platforms. To create is a vulnerable thing, so when someone shares something online, they are in a way offering it up because they believe it has value and might help someone else. Be kind to those that are brave enough to create and share. Because I follow so many interior design people, I will use them as example. The most popular interior design posts are of spaces that are filled with light! We are attracted to light and it is for a good reason. I have been able to find parallels between the images I interact with daily and spiritual principles. Also, we can remember that truth cannot always be captured in a photograph. We only see one moment out of innumerable moments in someone’s day and space. Whether you follow knitters, florists or just family, God expects us to find truth in whatever we encounter, and I believe that we can do that as we share and consume social media. I have been structuring my day in a way that keeps me busy from breakfast until my little ones go down for their nap. When I say busy, I mean too busy to sit on my phone scrolling through my Instagram feed. A friend came over today and mentioned that she can see how her constant checking of her phone has likely blocked moments of silence or reflection that could offer insight or personal revelation. Instead of internally asking Heavenly Father what He wants me to do, I am checking to see who posted last. Now, I do spend time almost daily checking my Instagram feed, but when I do it matters I try to do it after I study scriptures, write and meditate. When I don’t keep these boundaries, I feel the day slip away from me and I don’t pay attention to my husband, my kids and certainly not the needs of others who may be in need elsewhere. I hope that these ideas will help you to find joy and peace in your daily life. 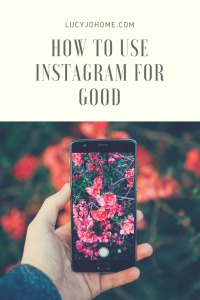 There is potential for good in social media and I am determined to use these tools to spread goodness. I hope you will do the same.